Prior to applying GuardTop® Sealcoat the surface must be prepped for the product. Proper preparation ensures a long lasting, quality job that will ensure customer satisfaction. The following simple guidelines are to help insure a quality job. For asphalt cracks that are 1/8 inch or larger, clean by brushing and treat with weed killer. Next apply Crack Filler by GuardTop®. The crack should be filled to match the surface of the rest of the pavement. For larger cracks, Crack Filler by GuardTop® may have to be applied several times. For large cracks that have broken asphalt and for areas that have broken asphalt, we recommend that the loose asphalt be removed and replaced with new asphalt. Extreme low spots should also be filled with new asphalt. It is recommended that new asphalt overlay should cure for a period of 30 days, and removed and replaced asphalt with depths of 4″ to 6″ be allowed to cure for 180 days minimum, before sealing with GuardTop® Sealcoat. Click here for more information on Crack Filler by GuardTop®. Sealcoat will not adhere to surfaces with excessive oil and grease. For a quality job, clean all oil and grease deposits with a degreasing solution using a stiff bristle broom or a power operated broom. Areas completely saturated are recommended to be removed and replaced with new asphalt. Then apply Oil Spot Primer by GuardTop® to all oil and grease stained surfaces. Simply brush in Oil Spot Primer by GuardTop® to the surface insuring full coverage over the stain. Click here for more information on Oil Spot Primer by GuardTop®. After all pavement repairs have been completed, the surface should be clean and free of all dirt, debris and existing pavement loose graveled particles. Please note that dirt and loose debris will restrict the adherence of the sealcoat. To clean the surface use a power broom, power blower or flush the surface with high pressure water. This process will ensure a long lasting quality job. For best GuardTop® Sealcoat results it is recommended that the surface be sprayed with a mist of water in an amount that will leave the surface damp and free of standing water or puddles. The misting procedure is critical when the ambient temperature is hot and on bright sunny days or when the pavement is excessively aged and porous. In these instances, the pavement will draw the water out of the sealcoat at a more rapid rate than recommended unless the surface is pre-watered. For excessively weathered surfaces a primer or fog seal should be applied to the surface. The primer should consist of a 50/50 mixture of SS1-H and water. Apply the mixture to the surface, let dry and then apply GuardTop® Sealcoat to the surface. After the surface has been properly prepared, GuardTop® Sealcoat can be applied. GuardTop can be mixed with water to obtain a desired consistency for the job requirements. The maximum dilution for the product is 20% water to 80% GuardTop® Sealcoat. Please note that care should be taken not to over dilute the product. As pavement increases in roughness, the amount of dilution should be decreased. GuardTop should be applied in the following steps. Prior to applying the first coat, mist the surface with water. Then apply GuardTop® Sealcoat using a truck mounted tank, wheeled container, or can. Spread in continuous parallel lines by means of rubber-faced squeegee, spray equipment or by broom. This process can be completed by hand or by machine. All tools should be misted wet before use to avoid product adhesion. After material has been applied to the surface, the GuardTop® Sealcoat should be spread by pulling or spraying the material toward the operator in a manner that will eliminate all ridges and air pockets. For excessively rough areas consult your manufacturer’s representative. After the first coat has completely dried, re-mist the surface with water, check to see that the surface is clean and free of all debris and apply the second coat using the same application process as the first coat. If a third coat is required repeat this step. GuardTop® Sealcoat should be allowed to dry a minimum of 24 hours before heavy traffic is permitted. Please note that when asphalt is cold, in shade, or the air temperature is below 75 degrees, drying time may need to be extended. GuardTop® Sealcoat should not be applied in temperatures below 55 degrees. If ambient temperatures exceed 100 degrees, extra care should be taken in preparing the surface. Material should not be applied within 48 hours of forecasted rain, as rain may affect curing of asphalt sealcoat products. Striping for parking or traffic flow should be completed only after the sealcoat has thoroughly dried. It is recommended that a high quality water based traffic line paint be used for best results. roper application rates depend greatly upon the type and condition of the pavement. Porous or very old pavement absorbs a greater amount of the sealcoat, therefore requiring more material. When there are many exposed rocks and aggregate in the pavement, a greater depth of seal coat will be required for proper coverage. For best results, GuardTop® Sealcoat should always be applied with two coats. 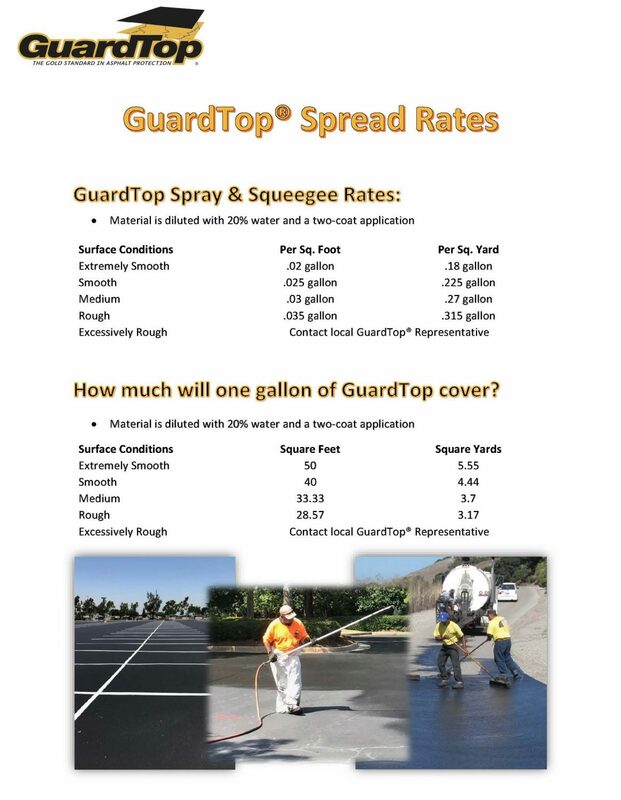 The following table can be used as a guideline of GuardTop® coverage per square feet of surface area. This table is based on two coats prior to water dilution of the product. Please note that this is only a guideline and exact coverage depends upon both the condition of existing pavement and the surface condition desired after application. Smooth Dense pavement 25 to 30 gallons per 1,000 sq. ft. Rough, aged surface 45 gallons per 1,000 sq. ft.
GuardTop® Sealcoat should be allowed to dry a minimum of 24 hours before heavy traffic is permitted. Please note that when asphalt is cold, in shade, or the air temperature is below 75 degrees, drying time may need to be extended. GuardTop® Sealcoat should not be applied in temperatures below 55 degrees. If ambient temperatures exceed 100 degrees, extra care should be taken in preparing the surface. Material should not be applied within 48 hours of forecasted rain, as rain may affect curing of asphalt seal coat products. All asphalt pavement shall be sealed with two coats of GuardTop® Sealcoat with surface preparation and application to conform to manufacturer’s recommendations. Note 1: Meets California Greenbook 203-9 Specification. Method for determination of nonvolatile components: Weight 10 grams of homogeneous product into a previously tarred, small ointment can lid. Place in a constant temperature oven at 325 degrees for 1 ½ hours. Cool, re-weight and calculate nonvolatile components.